St Patrick’s day as a brand in Ireland is often seen as re-imported such is the prominence of re-broadcast Irish news items featuring American presidents, cities with green rivers and a running joke in the Simpsons. This year RTE ran a glowing piece showing the Sydney Opera house matched with a financial building in Abu Dhabi joined together by St Pat and strong green lighting. Dramatic foreign picturesque events should not be looked at as an Irish performance benchmark for March 17 as we have come to terms with the fact of having no ownership of this brand abroad. It’s common knowledge that Obama’s casual vist to an Irish bar this year in Washington spoke to the Irish vote for America rather than any meaningful gesture to our sainted isle. The meaning of the day is now whatever you want it to be. And so it should. 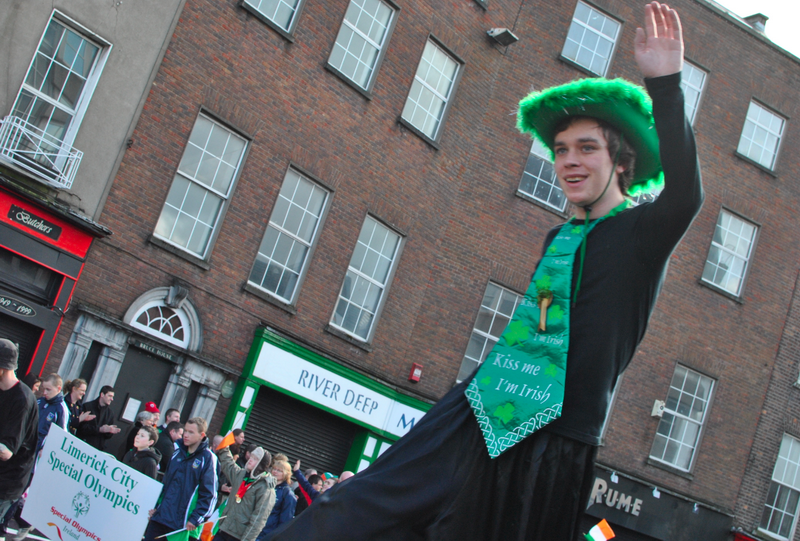 Let everyone now fashion a paton saint to serve both corporate interests and the craic of a day off. 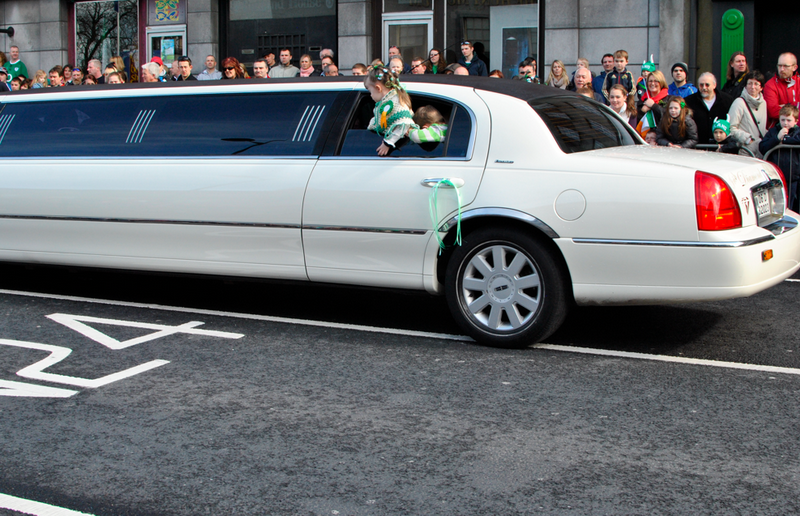 In Limerick the day manifested by the parade is a celebration of people and the city. Previously, in various counties I usually spent this day working either as a parade participant or as a photographer (contributing to ‘The Brand’) but this year I spent it as a member of the public and watched the city pass by outside the Hunt Museum. What was immediately evident in the excited atmosphere was the amount of collaboration between crowd and participants. It was easy here for anyone local or otherwise to get caught up in the support and reasoning of this parade as it peopled itself through the city. Between the cheers and shouts of recognition there was plenty of detailed commentary from friends and relatives filling in on the Friends of the Elderly walk-past, bands, and various school and sports groups. Confusingly, youngsters behind the barriers screamed for attention at random flag carriers and other facepainted adults who came over for brief chats before carrying on. I realised that those in the parade were teachers or assistants and their fans were those who were previous participants or knew them from weekend workshops. March 17 always showcases the creative community work that has been ongoing for months but the interaction through the barricades registered just how much off it there is in Limerick. The gangs of cardboard covered children in the Limerick Printmakers and also Northside Learning Hub LSAD assisted group stood out in this celebratory context. The public spirit of Limerick remains its diversity and pride in an understated public identity and the rhythm of the parade reflected this. A chanting group from a primary school would be bookended by a fire engine and the Limerick Filipino community, who showcased a beauty pageant on a truck with a raucous rock n roll band. This band were fully aware of their situation and rose to the occasion by gleefully belting out ‘you may be wrong, I may be crazy’ by Billy Joel. I realised that the presentations that conventionally did not make sense spoke the loudest in representing the city. Most enjoyable was the speculation on possible meanings in clusters and groupings. For example, why were a troop of scouts armed with attitude and water pistols and what was with the unexpected and heartening cheer that greeted the inter-faith groups walk-by? There is a traditional local business aspect in parading wares and trades on this day. An Irish cliché has many a small town shivering on the sidelines waving flags as the local car dealership makes its annual drive by. However it is often in this self-designed world that the richness of the local vernacular is glimpsed often just once a year and intentions and self initiated creativity triumph over formal artistic approaches. Illustrating this I very much enjoyed the surrealism and fun contained in a parade float from Crecora, County Limerick. Stone Age brick and stone supplies may have simply designed their contribution as a showcase of their sculpted wares but in treating the flatbed as a theatre set they ended up presenting much more. A Victorian nymph kneels in a job lot of sand to face a galloping stone horse and foal. 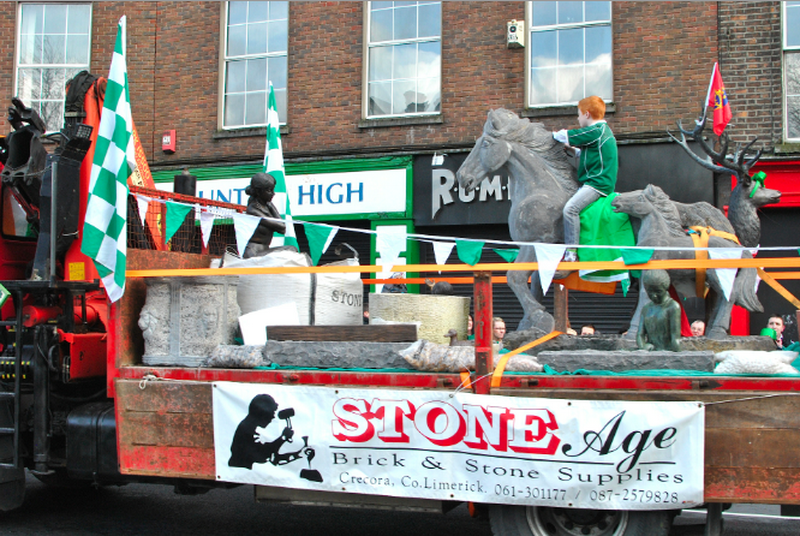 Riding the horse is a live redheaded horseman in a Limerick jersey with a tricolour for a saddle. He ignores a duck at the horse’s feet and also a backwards-facing stag. The feeling is mutual. So preoccupied is the stag that it pays no attention to the Munster rugby flag tied to its antlers. Perhaps it is because there is a small green hat covering its eyes. Quietly at the back, a smaller nymph seems to be dreaming all this at once. 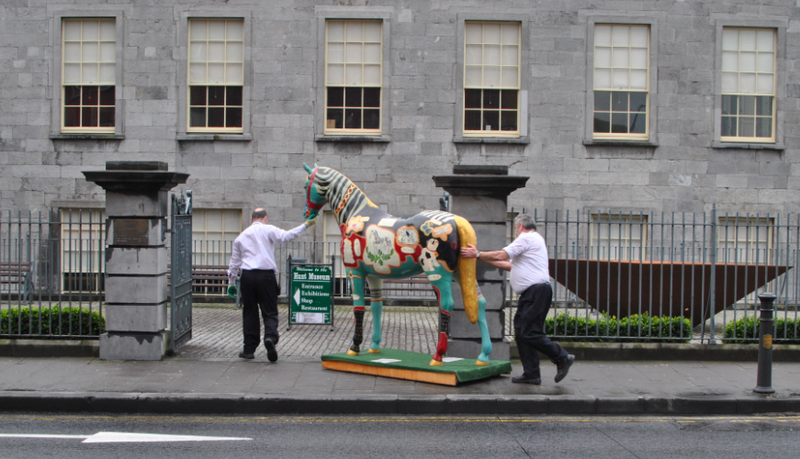 Any creative situation involving a horse is currently very ’Limerick City’ and as the tableau from Stone Age Brick and Stone passed the Hunt I imagined that somewhere in its building the gilded horse from the Horse Outside community art project nodded its head in approval. In celebrating a Limerick confident with its unique self reflection, and creativity may I suggest that It is only a matter of time before the Rubberbandits are asked to lead the parade.